Diesel fuel is often subject to long storage periods, especially in tanks with infrequent utilisation. What’s more, the fuel can separate, producing a deposit of solid particles and water at the bottom of the tank. This is due to the prolonged lack of usage of the unit. This can lead to pump damage and components becoming increasingly sensitive when switching on the motor. That’s why HYDAC has developed the LVU-CD10 diesel fuel conditioner and the LVU-CD40 diesel particulate filter. 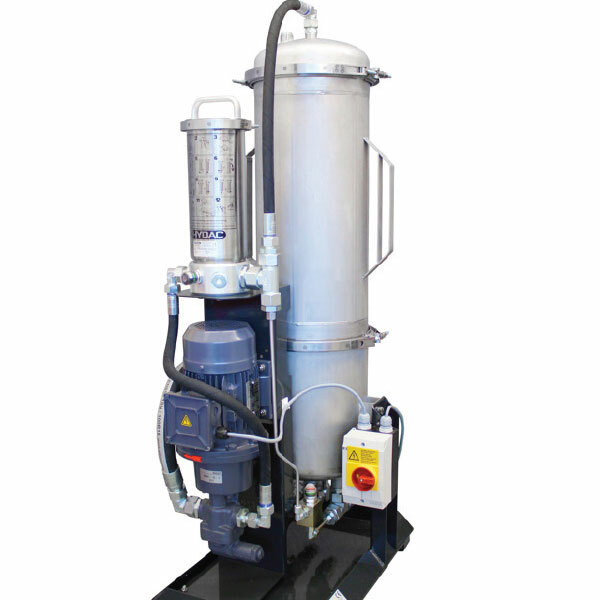 These units will help you remove water from diesel and reduce the effects of potentially dangerous contaminants. Therefore, the use of either fuel water separator is crucial, and not only for the quality of the diesel fuel. Why is Using a Diesel Water Separator Important? In addition to contamination from settled particles and other solid matter, free water in a tank (over an extended period of time) can become a breeding ground for diesel fuel pests such as bacteria, algae and fungus. This can quickly lead to blockage of the machine filter and damage to the diesel injection system components. Use of a diesel particulate filter or fuel water separator can prevent or minimise the chances of damage from occurring. The use of the Low Viscosity Unit LVU minimises diesel fuel contamination to a system and prevents expensive system downtime. Spare parts won’t need to be ordered, nor will extensive (and expensive) maintenance or repairs be required. To find out more about how to remove water from diesel and ultimately protect your valuable machinery, get in touch with HYDAC today to inquire about a diesel particle filter.